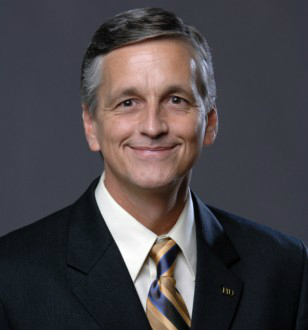 Kenneth G. Furton was appointed Provost and Executive Vice President of Florida International University on July 2014. He is a leading scholar in forensic chemistry, specializing in scent detection. He served as the dean of the College of Arts and Sciences from 2007 to 2014, where he transformed the university's largest college into three mission-based interdisciplinary schools to explore and address some of the biggest issues facing society today. During his tenure, the college of Arts and Sciences raised over $41 million in philanthropic gifts and saw its research grants funding increase from $27 million to $60 million annually. In 2014, Dr. Furton chaired the iREAL (integrating Research, Engagement, Assessment and Learning) Commission on the future of FIU and led the committee that created FIU's 2015-2020 BeyondPossible2020 Strategic Plan. Having started at FIU in 1988 as an assistant professor in chemistry, Dr. Furton in 1997 founded FIU's International Forensic Research Institute (IFRI), which is globally recognized as one of the premier research and teaching institutes on forensic science. He subsequently served as associate dean of budget, facilities and research and remains director emeritus at IFRI, where he continues to be active, directing the research of graduate and undergraduate students and publishing papers and filing patents. Dr. Furton earned a B.S. in Forensic Science at the University of Central Florida in 1983, a Ph.D. in Analytical Chemistry at Wayne State University in 1986 and completed post-doctoral studies in Nuclear Chemistry at the University of Wales, Swansea, and U.K in 1988. His expertise has led him to serve in numerous local, national and international professional organizations, including the National Academy of Sciences, the National Nuclear Security Administration and the Scientific Working Group on Dog and Orthogonal Detector Guidelines, which he chaired since its inception in 2004. He is currently chair of the Organization for Scientific Area Committees Dog and Sensor working group of the National Commission on Forensic Science. Deeply committed to the academy, Dr. Furton is the author or co-author of more than 800 publications and presentations. His research projects have been continuously funded for more than two decades, totaling more than $13 million in external funding. He has shared his expertise in forensic science through hundreds of invited talks nationally and internationally and has testified as an expert witness in dozens of state and federal trials. Analytical Chemistry, Forensic Science, Physicochemical studies and applied aspects of gas, liquid, and supercritical fluid. chromatography, supercritical fluid extraction, solid phase microextraction, forensic chemistry, arson and explosives analysis and canine detection of chemicals.